Blurb From Goodreads:In the not-so-distant future, the forecasted “death of print” has become a reality. Bookstores, libraries, newspapers, and magazines are things of the past, and we spend our time glued to handheld devices called Memes that not only keep us in constant communication but also have become so intuitive that they hail us cabs before we leave our offices, order takeout at the first growl of a hungry stomach, and even create and sell language itself in a marketplace called the Word Exchange. Why Read: I was lucky enough to find this on NetGalley before I realized I had downloaded too many books (if there is such a thing). There was the other side portion of my luckiness in that it was a book that hit many of my ‘yes’ buttons: Books about words, dystopia and science fiction. 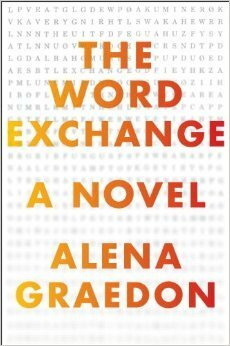 Review: When it comes to reading books about words and dictionaries: you can bet that I’ll be in the near vicinity in a heartbeat. Word XChang was no different. The dystopian vibe was matchless and as I read through the chapters (which alternate viewpoints between Anana and Bart) – I felt myself growing more and more attached to the book. It wasn’t just the characters, though they certainly played a big part in how much I enjoyed reading this book. Anana, the main character, was someone I felt I could empathize with (as she really knew nothing and mainly went off instinct). Her companion/love interest, Bart, was an interesting mix of a character that Anana is warned away from, but because his point of view is within the book – it’s difficult to not sympathize with him. Although it was trying, at times, to switch between Anana and Bart’s point of view, I ended the book enjoying the differences between the characters (and let me tell you – they definitely evolve). The plot was, I believe, special in that way – it was not particularly linear but it did go from past to future with a fluidity that felt natural. One particular idea that I couldn’t let go was how the Meme could be equated to Wikipedia use today, in that we are so obsessed with getting the information. To me it truly exemplifies the worse case scenario if society gets to the point where getting something quickly overcomes the actual knowledge of things.